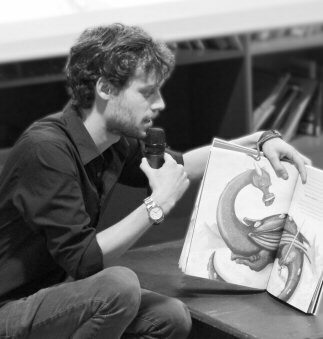 Biography of Aron Dijkstra, author and illustrator of the children's picture book "Nick the Knight, Dragon Slayer" published by Clavis Publishing, New York. Author and illustrator Aron Dijkstra (Sneek, the Netherlands, 1992) has been drawing since he learned how to hold a pencil. His creative mind stimulated him as a boy to imagine stories, which he brought to life with illustrations. Since then not much has changed. Aron moved to Rotterdam in 2011 to go and study to become a professional illustrator at the Willem de Kooning Academy. In 2016 he made his debut as an author and picture book illustrator at Clavis Publishing company with his book Nick the dragon slayer. Dynamical perspectives, accessibility and the use of colors are typical of Aron’s style. He prefers to work with traditional materials, such as ink, pencil and paint. He never uses a computer. Aron works at the Museum Boijmans van Beuningen in Rotterdam as a guide and as a teacher. At the museum he likes to study the craftsmanship of the master painters. At home in Pijnacker, a quiet village in the midst of the busy and densely populated Randstad, he creates new picture books.